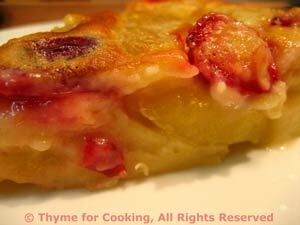 Peach or Plum Clafoutis, Thyme for Cooking easy summer dessert. 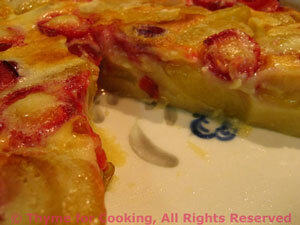 I made this with purple, green and yellow plums but you can use any fruit you like. Traditionally the French use cherries - un-pitted. Peaches and/or nectarines would be wonderful.... and even berries would work. To pit stone fruit, make a cut, vertically, (through stem end) all around the pit and twist lightly. If the fruit is 'freestone' the halves will come apart easily. If they are 'clingstone' the halves will not budge and you'll have to cut wedges off the stone. My purple plums were freestone, my green ones were not. Note: You will need enough to lay, nicely, around the bottom of your baking dish. My plums were small and I used about 20 of them. With larger peaches or nectarines you would probably need 10. If they are really large quarter them to lay better - you don't want them higher than the sides of the baking dish. Melt the butter, remove from heat and set aside. Put sugar, eggs in a deep bowl and whisk (with a large whisk) until they turn lighter in color, about 2 minutes. Gradually add the butter, whisking constantly. Add the flour, all at once, and whisk until well combined. Slowly pour in the milk, whisking constantly. Add the vanilla. The batter should be smooth and shiny. Put the fruit, cut side up, into a buttered glass baking dish, quiche pan or deep pie plate, (or even a round metal cake pan) 10 in. (25cm) in diameter. Pour the batter over the top and bake, 400F (200C) 30-40 minutes. It should be slightly browned and almost completely set in the middle. Let sit 10 - 15 minutes before slicing and serving. Serve warm, at room temperature or cold. Note: It's easier to put the baking dish on a baking tray before you pour the batter over. It's easier to handle and if you spill it's on the tray! The center will just barely jiggle when it's done.